Back when I first started cooking, I didn’t know that there was such a thing as non-non-stick cookware. (Stick cookware?) Non-stick cookware made for easy clean-up! It let you use less oil and butter in your cooking! It was pretty much the best invention ever, right? The biggest hurdle for me in switching to cast iron was the cost. But if you’re replacing your non-stick cookware every few years like I was, in the long-run, cast iron ends up being cheaper because when cared for properly, it should never need to be replaced. When I first started using cast iron, I was burning a whole mess of food. I felt frustrated and wondered if maybe I made the wrong decision. Well, I should have read the little booklet that came with my cookware–cast iron retains heat better than other cookware, so you need to keep the temperature a little bit lower than you would with your non-stick cookware. Enamel cast iron, like Le Creuset, can be washed with soap and water just like other kinds of cookware. Black enamel can be either rinsed in hot water or cleaned with soap; with use, it will develop a patina, which looks a little bit like rust, but it actually helps keep food from sticking. Regular, non-enamel cast iron skillets should be rinsed with hot water or scrubbed with coarse salt; once dry, the skillet should be coated with a thin layer of cooking oil. This takes some getting used to–I still have a nagging feeling that my cast iron skillet isn’t clean after I use it. For this reason, I prefer using enamel cast iron. My absolute favorite thing about cast iron cookware is that it goes from stove to oven. When I make mac & cheese, instead of transferring it to a casserole dish, I can just leave it in the pot, top it with breadcrumbs and cheese, and pop it in the oven to bake. You can even use cast iron Dutch ovens to bake cakes and breads. I used to make quesadillas on my panini maker, but after a few mishaps where more cheese ended up on the grill than in the tortilla, I’ve started making them in my enamel cast iron skillet instead. I use just a little bit of oil to get them perfectly crispy on the outside. 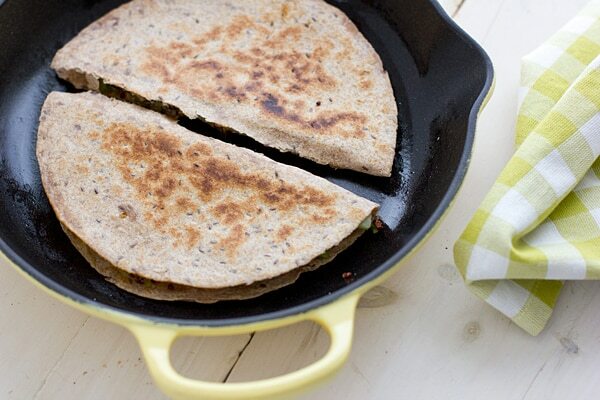 These Broccoli Quinoa Quesadillas are a simple, kid-friendly meal, ready in under 30 minutes. 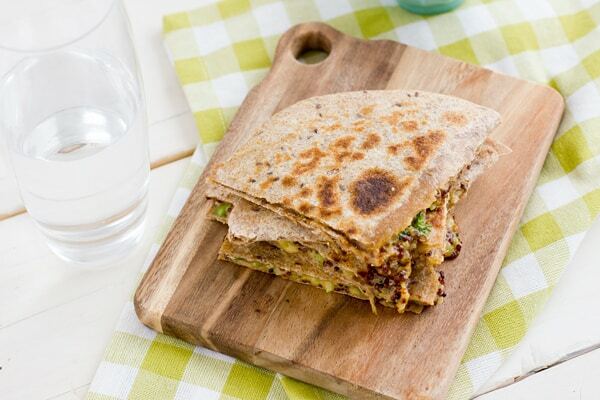 Quinoa can be a tough sell, but adding it to cheesy quesadillas is sure to win over even the pickiest eaters! 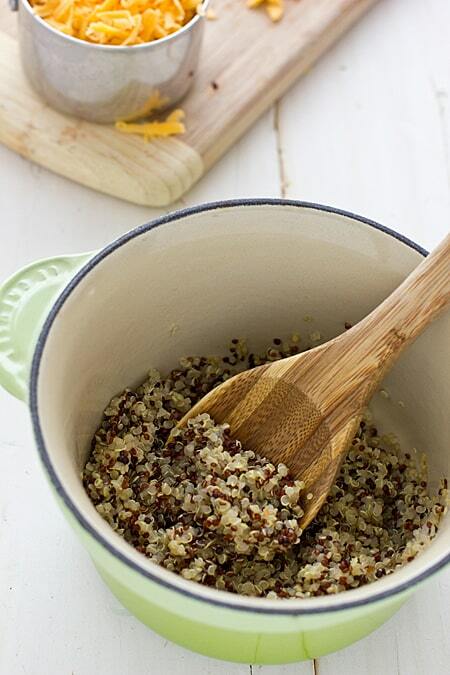 Combine quinoa, broccoli, and cheese in a medium bowl. Season with salt and pepper to taste. Divide mixture evenly onto one half of each tortilla; fold top of tortilla onto filling. Heat one teaspoon of oil in a medium cast iron skillet over medium heat; swirl to coat. Place 2 quesadillas in skillet and cook until browned, about 3 minutes on each side. Add another teaspoon of oil to skillet and repeat with remaining quesadillas. Cut into wedges and serve. Disclaimer: Although I bought almost all of my cast iron cookware myself, Le Creuset sent me a few pieces to finish out my set. This had no influence on my opinion of their products–I have used them for years! So nice that you’ve completed your set now. I really like cast iron cookware as well, although I only have a very few pieces at the moment. I’m SO happy you wrote this entry. I thought it was me being a fool, when it came to pots with the non-stick. They keep falling apart on me no matter how much I try to take care of them. I’ll take your advice, although on a pension it’s quite a cost, but…. one at the time and for birthdays etc. I’d think! Yes, I was so careful with mine and I’d still notice the finish getting scratched up. Enamel surfaces can get scratched, but they’re not nearly as bad as the non-stick–I swear, they scratch if you even look at them the wrong way! I’ve never owned cast iron. Now I want to try it. There’s definitely a bit of a learning curve when you switch, but in the end, I like it much more than non-stick. Quinoa is a quesadilla? Genius. I need to try this asap. oh I LOVE my cast iron cookware!! so I have a question – my Le Creuset cast iron skillet can been cleaned with soapy water? I just assumed that because the cooking surface (where the food touches) was cast iron, that I could not use soap on it, or am I confused? How pretty and healthy it this!? Adding to the weekly menu! Love cast iron but its expensive. I’ll have to look for a deal! I love my local Le Creuset outlet–they have some really great sales! 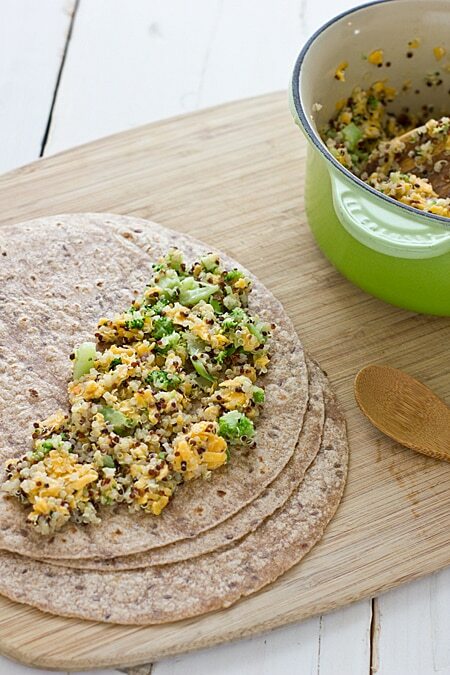 Broccoli and quinoa in a quesadilla — freakin’ love it! Genius! We’ve eliminated all of the cancer type non-stick cookwear from our kitchen. We’re about 50/50 between stainless steel and cast iron these days. I love my cast iron skillet! I just have an inexpensive Lodge brand and I love it! now i need to start saving for some cast iron skillet too. I have been experimenting with lots of nonstick pans and like you said- you spend more money actually. and this quesadilla looks really really goood! I love this, and I stumbled it… Great stuff! Looks terrific! Any thoughts on what to use instead of cheese (either real or fake) if you’re a vegan? I know this sounds weird, but I love using mashed sweet potatoes or butternut squash as a binder in dairy-free quesadillas. It keeps everything stuck together and in its place without using fake cheese. I will try it! I probably mentioned it already, but I love broccoli! i just came across your blog on pinterest…doing a search for tempeh 🙂 loving all your recipes…and this post cracked me up…i was so the same…and i would have never thought of buying a non-stick pan that would be crazy! I try to use cast iron, but I only have one skillet so it gets difficult! I need to get more though – I love the way that things brown in them and get that crazy delicious crust. Like these quesadillas, which look phenomenal! I would never think to put quinoa in my quesadilla, but now I need to try it! I’ve been wondering about cast iron too, so far I have a cast iron grill pan and a small cast iron pan. I will work my way up to buying others too. I love cooking bread in my small pan– dinner rolls come out wonderfully browned, much better than in a baking pan. I don’t bake a lot of bread, but I’ve been wanting to give that a try! My kids are weirdos and they love quinoa-something that I’m very grateful for. I know they would love these. Thanks for sharing! Cast iron is great! Only thing – it’s not ideal to use on glass stovetops. I’ve read that it’s fine on glass stovetops, but it just shouldn’t be slid around on them because it can scratch the cooktop and the cooktop can scratch the enamel. Is there another reason not to use them on glass? Curious because my stove is a glass one! Cast Iron is a huge hit in the autism recovery community. We all know that non-stick cookware is not safe, it releases toxins and interestingly if heated at a high heat it can off-gas and kill small animals such as birds that are often kept in the kitchen. Really bad stuff. We use only stainless steel or cast iron in our home. We can’t afford the toxins released by other cookware. Great little cast iron tutorial. I recently (finally) got a Le Creuset enameled cast iron skillet and use it all the time. I have a Dutch oven but get the most use out of my skillet. Love the color of yours! I have 6 cast iron pans and I love them so much. I still haven’t tried one of the enamel ones but I have been looking to find a deal on one.